This page explains very briefly how to create Qtopia applications using Mac OS X. It is assumed that you have already compiled native and cross versions of Qtopia. You won't find any details about Qt and Qtopia here, but there are plenty of tutorials on the web (and also in the documentation included with Qt - take a look at the folder "<src-dir>/qtopia.mac/qt-x11/doc"). If you find something on the web, please be careful with instructions about setting QTDIR, TMAKEPATH, and similar environment variables. Chances are that these instructions won't work unaltered on the Mac, but below you can find a script that should make things fairly easy. First, create a directory that will contain all files for the application. 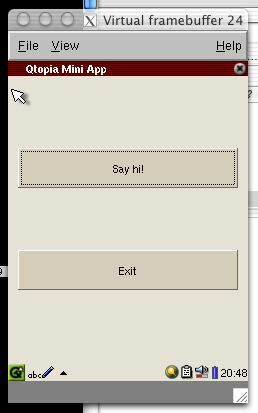 It will be just a minimal example with two push buttons and a dialog box. The two data members of type QPushButton point to the buttons used in the mini application. The slots sayHi() and exit() react to clicks on these buttons. Finally, _miniLayout points to the layout used (a simple grid layout). The caption of the widget is set to "Qtopia Mini App". A simple grid layout and two buttons are created. The buttons are added to the layout in column 0 and lines 0 and 1. The layout is adjusted a little by setting the margin. Finally, the slots are connected to the clicked signals of the push buttons. <src-dir> and <work-dir> are the same as the ones used for building the cross-compiler and Qtopia. The script will generate two files: "native.env" and "cross.env". These can be used to set all variables necessary for building and executing native and cross versions of applications. "native.env" takes care of setting all environment variables (including PATH so that tmake can be found). After that, tmake creates a Makefile, and make finally builds the native version of the mini app. The mini app should now show inside qvfb. You should now be able to run the mini executable on the Zaurus (and trying to run on the Mac will produce an error message). This was only a very short intruction, and you should go search the web and Trolltech's documentation for more information. Happy hacking!